Huntre Allard talks with a teacher on February 11, 2019. Photo by Mark Brown/Blackburn News. A nine-year-old Windsor boy in the midst of a courageous fight did something some did not think was possible. 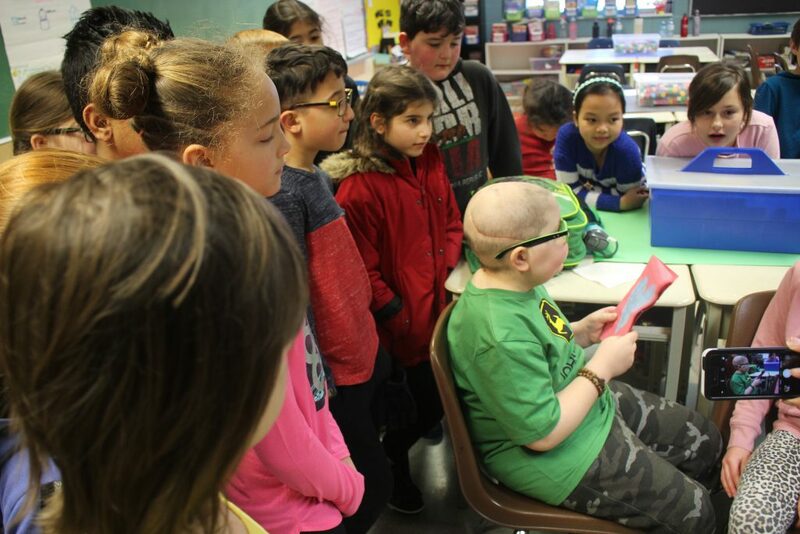 Huntre Allard, currently being treated for a rare, incurable brain cancer known as grade-four glioblastoma, received a hero’s welcome as he set foot in a classroom for the first time since being diagnosed last summer. Huntre was cleared by his doctors to return to class. 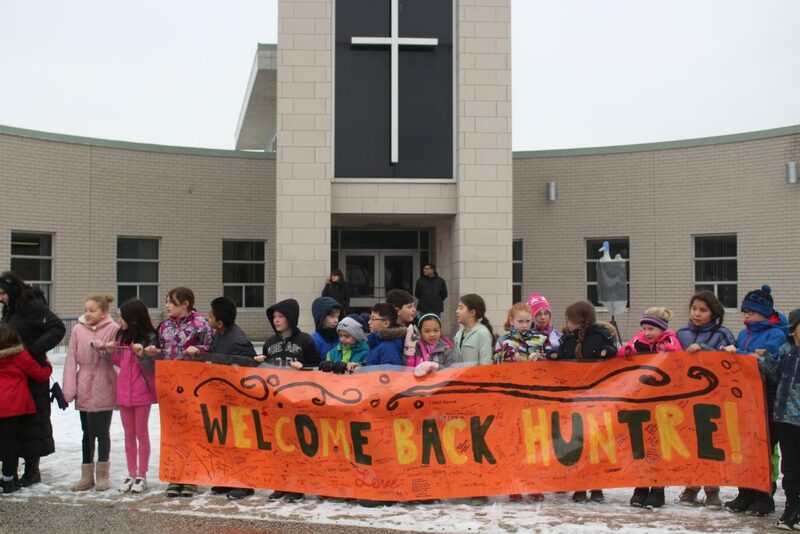 The entire student body at Windsor’s Our Lady of Perpetual Help Catholic Elementary School lined up outside on a chilly Monday morning, waving banners as Huntre was driven to school. A crowd of students, teachers, and reporters accompanied Huntre to his classroom, where he was given cupcakes, cards, and greetings from his classmates. Huntre said Monday was a day he had been looking forward to for a long time and he was happy to see how everyone came out to welcome him back to school. “When she [Huntre’s mother] came out on the street, she was like ‘Are you excited?’ and I said ‘yes,'” said Huntre. Huntre had been out of school for over a year, according to his mother, Lisa Aylesworth. She said her son had been unable to attend school even before he was diagnosed last summer. Chemotherapy remains part of the routine for Huntre, along with periodic appointments in London. Aylesworth said Huntre will start back easy, going to class several times a week and for half-days, with the potential for more once he has more energy. Nevertheless, Aylesworth is overwhelmed by the fact that her son has made it back this far. A fundraiser is being planned to help Huntre and his family with treatment expenses. It is scheduled for Saturday, March 23 at the Royal Canadian Legion Hall, Branch 143, on Marentette Ave. in Windsor. Tickets are $20 for adults and $15 for kids under 10, with food, drinks and door prizes. Tickets can be purchased by calling (226) 344-9476.